Shortly before the end of the year finally an update again. I had already planned it in August, but unfortunately I couldn't find the time again. I wish you all happy holidays and a good year 2019! The episode novel "City" is now also available in Georgian under the title ქალაქი [Kalaki]. It already appeared in 2017, but I discovered it only now. This year "City" was also published for the first time in Romanian under the title Orașul. City is now available in 27 languages! And again "City": After the novel was published in February 2018 in Russia in a Omnibus, it was published again in September as a single issue with the title Город [Gorod]. The narrative "I Had No Head and My Eyes Were Floating Way Up in the Air", which was published in 2015, now had its first translation. It appeared in the Russian-language magazine "Mlechnyy Put'" ("Milky Way") № 1, 2018, which is published in Israel. In the Ukraine Isaac Asimov published Anthology "Before the Golden Age" in russian language, including the story "The World of the Red Sun". This means that 13 of the 18 novels available as e-books from Open Road Media are now available in print. The following are still missing: "The Fellowship of the Talisman", "Our Children's Children", "Out of their Minds", "Project Pope" and "Shakespeare's Planet". 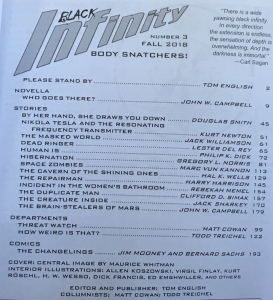 In the magazine Black Infinty #3 was the Simak story "Good Night, Mr. James" under the title "Duplicate Man" and there is also a photo of the table of contents where this story is listed. The magazine was then unavailable for a few weeks and is now available on the sales portals without the Simak story. Apparently there were copyright problems here. It is not quite sure if the magazine was ever delivered with the Simak story. Hellhounds of the Cosmos as Hardcover at Wild Press and twice at Create Space: May 24, 2018 and July 4, 2018. Empire appeared six times at Create Space: May 15, June 12, July 5, July 7, July 14 and July 31. The prices are getting more and more outrageous. For example, the June 12th issue of Empire costs $28! I hope very much that this nonsense stops sometime. After all, we have been spared further publications since August. At Open Road Media the next two issues of the e-book bundles "The Works of Clifford D. Simak" released. The selection remains somehow mysterious. The two anthologies were originally as volume 1 and 2 of "Complete Short Fiction" and now come out in bundles 3 and 4. The e-book anthology "The Science Fiction Archive #3" contains the Simak story "Second Childhood"
The magazine "Wonder Stories" from December 1938 is called digital reprint output released, including "Loot of Time" by Clifford Simak. It's the public domain stories again, but they're all Korean first releases! The title of the Russian audio book anthology Созвездие Льва-3 has been extended to Созвездие Льва-3: Приход ночи and the year of publication has been set for 2017. Today is the 30th anniversary of the death of Clifford Simak and it is also the 5th anniversary of my website!! I started in 2013 with 5500 publications of Clifford Simak's works in more than 2700 editions. Initially, only printed editions of his novels and stories were included in 31 languages. Meanwhile comics, e-books, audio books, radio shows, films, TV series and even plays have been added. The bibliography now covers almost 7,000 publications in almost 3,500 editions. And there are now 35 languages. The International Clifford Simak Bibliography has been around for 5 years now! I would like to take this opportunity to thank all readers and friends, especially those who have actively contributed to the completion through their comments and information, such as David Wixon, Zacharias Nuninga, Endre Zsoldos, Ivaylo Stoev, Roberto Maitilasso, Scott Henderson and Rüdiger Tomczak. Not a new publication at first, but a reference to a very old publication. Some of you may not even know it: long before Clifford Simak was able to sell his first SF story in 1931, he already published something. In December 1922 (!) appeared in the magazine Fig-leaf from him the poem "Jazz". This is the earliest trace of his literary activity; at that time he was only 18 years old! This poem existed in my database for a long time, but so far it was invisible to the visitors. On the occasion of today's anniversary I make it now callable. To do this, the category "Poems" had to be introduced in the "Type" selection field. In February Armchair Fiction released the 14th episode of the series "Science Fiction Gems". This time Clifford Simak's story "Beachhead" is included under its original title "You'll Never Go Home Again". The World That Couldn't Be (in a new magazine called Black Infinity #1 from October 2017 and as single issue from January 24, 2018. Project Mastodon (February 27, 2018. The subtitle of this issue is "Special Edition". I have not yet found out what is "special" about it. Maybe the price of $ 6.99. The story has been available free of charge for years at Project Gutenberg and who wants it printed should rather buy it for a few dollars antiquarian, e.g. with the collection "All the Traps of Earth". The update was basically already finished when one day, April 15, 2018, all four books mentioned appeared again: Empire, Hellhound of the Cosmos, Project Mastodon and The World That Couldn't Be. Cover design is becoming more and more unimaginative and has absolutely nothing to do with the content. Two older reprints have been published with the same cover but with different ISBN and now as hardcover: Second Childhood (for Positronic Publishing, Output Paperback 2016) and Project Mastodon (for Wilder Publications, output Paperback 2009). The omnibus Город (City), which was already announced for 2017 (and was already contained in my update of 18. January 2017), has finally been published in February 2018. As announced, the Fixup novel "City" and the original story volumes "Strangers in the Universe" (11 Stories) and "The Worlds of Clifford Simak" (12 Stories) are included. Instead of the originally announced unknown anthology "Grotto of the Dancing Deer", the 10 stories of the anthology "The Best of Clifford Simak" are now also included. This has been corrected accordingly in my database. The book is also available as E-Book. In Russia appeared an anthology called День охотников, which contains the Simak story "Loot of Time". After The Goblin Reservation appeared the second novel in Ukrainian language "All Flesh is Grass", again in 2 different issues. After a 10 year break there is finally another Estonian release: Kirjastus Fantaasia published the novel "A Choice of Gods" (also as E-Book). I have also included an older Polish edition of "Time is The Simplest Thing" from 1984 in the bibliography. Actually, this was not an independent book, but one could extract the text from the issues 5, 6 and 7/1984 of the magazine "Fantastyka" and make your own brochure. Since these brochures are also frequently available on sales platforms such as allegro.pl, I have now decided to list this "output" as an independent title. The selection is hardly comprehensible. From the series "The Complete Short Fiction of Clifford D. Simak" are contained instead of the first two volumes the volumes 4 (Grotto of the Dancing Deer and Other Stories) and 8 (Good Night, Mr. James and Other Stories) now in the "Works of Clifford D. Simak". Considering that even within the story volumes the stories are wildly jumbled up without temporal or content-related criteria, Open Road Media has reached a maximum of confusion. Serapis Classics released another edition of Empire as e-book. So far I missed a CD from IDB Productions with the story "Hellhounds oft he Cosmos", which already appeared in 2016. Also in 2016 in Sweden an audio book with the story "The Street That Wasn't There" was published in English. Of the rare anthology "Science Fiction: Masters of Today" with Simak's "Desertion" Scott Henderson finally managed to find a picture. I have rectified and taken over this. The classical German anthology "Robots" from 1962 with the story "Limiting Factor" apparently exists in several issues. I found a different cover picture, which I have now recorded as additional output. This book has been reprinted later under the title "Die besten Science Fiction Geschichten". Unfortunately, Diogenes Verlag Zürich is very sloppy with the correct dates of the publication, so that it can never be completely clarified when which issue with which cover picture actually appeared. The Russian audio book anthology called Созвездие Льва-3 (contain in my update of June 5, 2017) has apparently still not appeared, but at fantlab.ru you can now see several cover pictures for the individual stories. I took over the picture for the included Simak story "Коллекционер (Leg. Forst)". Contrary to the original announcement, the anthology "Infinite Stars" by Bryan Thomas Schmidt contains not the Simak Story Honorable Opponent. Too bad. The book has been removed from my database. About 10 pictures were exchanged for better ones. This update was supposed to be released in August last year on the occasion of Cliff's 113rd birthday. It was almost finished, but then for some reason I got stuck with the processing of the pictures. Before I post newer releases, I deliver this update. In Ukraine, the novel The Goblin Reservation was published in two different versions. It is not only the first Ukrainian translation of this novel, but the first Simak publication in Ukrainian since independence. The few previous Ukrainian translations were all still from the Soviet Union, while in the independent Ukraine there were only publications in Russian so far. Also this year, the anthology До золотого века appeared in Belorussia with Simak's first SF story "The World of the Red Sun"
I also found an older Russian anthology Голос тьмы from 1985, which contains the story "Beachhead". The anthology Stellar #6is also a little older (from the year 1981). The US editions has long been included in the bibliography - now a Canadian edition has been added which differs in the price. In Armchair Fiction, the 13th series of "Science Fiction Gems" was released in June. The story "The Shipshape Miracle" is contained by Clifford Simak. It is the first English-language reprint of this story for 54 years! (In 2010 there was only one e-book publication). Of course, the Open Source titles can not be missing either. The World That Couldn't Be appeared for the umpteenth time at CreateSpace. It is noteworthy that the print editions of 3 of the 5 titles were not originally published by Heyne, but by Goldmann (Way Station), Ullstein (Gefahr aus der Zukunft) and Pabel (Ingenieure des Kosmos). Only from "Sternenerbe" and "Heimat Erde" were the original print editions published in the seventies by Heyne. Since the 5 new e-books have a new unit design, Heyne decided to provide a new cover picture for the only available e-book so far, "Als es noch Menschen gab (City)". This edition has the same ISBN as that of 2010 and on the sales platforms is also suggested that this e-book has always (so since 2010) looked as it looks now. But since it is de facto not so, I now run this e-book twice (published 2010 and 2017).. In Russia came to the recently published omnibus Принцип оборотня now also the corresponding e-book. There has been a lot happening in the last weeks and months and it was time to finally update again. A publisher named VintReads published an anthology called Madness From Mars: And Other Short Stories. It contains 8 Simak-Stories from the years 1939 - 1951. There are however no rare stories - the least published so far is "Mr. Meek - Musketeer" of 1944, but it appeared already in volume 2 of the "Complete Short Fiction of Clifford D. Simak" (2015 as an E-Book and in 2016 even as a paperback). The anthology "Madness From Mars" was initially announced only as an e-book but then in April under this name it only appeared as a paperback. The e-book edition is now called A Collection of Short Stories. Both editions are now no longer available. The publisher's website - vintreads.com - is registered in Norway, which is why I list the book as a Norwegian edition in English. After a new Russian omnibus named Город (City) (which I've announced in January, but it has not been released yet), Eksmo in Moscow announced another new edition of City for this month as part of the new series "100 glavnykh knig". Also at Eksmo appeared a new Russian edition of Time is the Simplest Thing. In the Russian anthology Тени минувшего appeared the story "Small Deer". The first edition of the anthology Первые люди. The Simak story Contraption named a false author (Murray Leinster). This mistake was then made again in 2006, when the story (apparently taken from here) was published in a Russian Leinster collection. A collection of 1990 with 3 stories: Vse ostayetsya pobeditelyu / Mest' mistera D / Razvedka, including Clifford Simak's "Skirmish"
The magazine Pioner 1/93 with "Over the River and Throgh the Woods"
In Bulgaria this month a new edition of Резерватът на таласъмите (The Goblin Reservation) will be released. It is already the fourth Bulgarian edition of this novel (Thanks to Ivaylo for this information). In Italy, a new collection appeared in March: All'ombra di Tycho. It is, however, basically the Italian edition of "The Worlds of Clifford Simak" ("Gli extraterrestri"), in which the story "The Big Front Yard" was exchanged with the title story "The Trouble with Tycho". At Titan Books in Great Britain the anthology Infinite Stars: Definitive Space Opera and Military Science Fiction by Bryan Thomas Schmidt will be published in October. It contains the story "Honorable Opponent" of Clifford Simak. For the present the book is only published as a hardcover - the paperback edition is announced for May 2018. Note April 2018: This information proved to be incorrect. The book is now available, but does not contain a Simak story. The publishing house Coachwhip Pub. 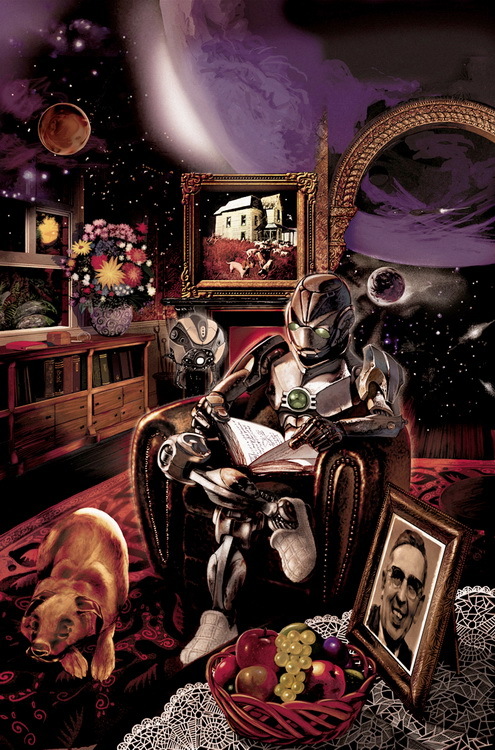 From Ohio published in March 2016 the anthology Other Life: An Anthology of Non-Terrestrial Biology with the Simak story "Green Thumb" "Green Thumb"
A month later, in April 2016, the anthology Galaxy Science Fiction Super Pack #2 appeared by Positronic, with the Simak Story "The World That Couldn't Be". The book is also available as an E-Book. Between February and April alone appeared 4 times Hellhounds of the Cosmos: February 10, February 24, April 3 and April 29. And completely new the anthology The Variable Man and Other Stories with the story "The Street That Wasn't There" (May 27). At Jovian Press Second Childhood and The World That Couldn't Be appeared at the beginning of 2017. The anthology Strangers No More, which I had already included in the update in October, then appeared in February with a slightly changed title as originally announced, as well as the e-book. The image has been corrected. the Swedish SF magazine Jules Verne Magasinet 446 from April 1991 with the story "Shotgun Cure"
the continuation in the Soviet newspaper Komsomolskaya Pravda of January 1965 with the tale "How-2"
the British edition of Time and Again of 1956 (publisher William Heinemann). I had never seen this title before until recently. the British edition of Short Stories - A Man's Magazine of August 1958 with the Simak story "Nine Lives". This book was published in Australia, but it was intended for the whole British Empire. (In a timely release for the Australian market the Simak story was not included.) Also, this picture I had never seen before a few days ago. Thanks to Scott Henderson! There were about 100 title pictures for better exchanged. With Persian, there are now 35 languages into which the works of Clifford Simak have been translated so far! Sometimes it is strange. Shortly after I had the last update, I stumbled on the web about information about other publications that were missing in the bibliography. In the depth search for these titles, I found more and more and even more .... Some of these releases are already a few years old. This shows me that it is probably impossible to create a complete bibliography. Soon I had so many titles together that it is now worthwhile to make a new update after less than 3 weeks. Here it is. Worst Contact from the beginning of 2016 with the story "Shadow World". And completely new If This Goes Wrong ... from the end of 2016 with "Day of Truce". Already in 2000 the anthology Immortals (Αθάνατοι). appeared in Greece. I suspect it is a translation of the US anthology Immortals by Jack Dann and Gardner Dozois from the year 1998. "Grotto of the Dancing Deer" would have to be included, but I do not know for sure. Another Greek anthology appeared last year: Νεκροναύτες και άλλες σκοτεινές ιστορίες επιστημονικής φαντασίας with the story "Good Night, Mr. James". Also last year in Georgia an anthology with a Simak story appeared: 8 with "Immigrant"
A Swedish anthology with the title Första Stora Science Fiction Boken has been released in 1997 and also contains a Simak story. Which - that I could not find so far. Магистраль Вечности with "A Choice of Gods", "A Heritage of Stars", "Special Deliverance" and "Highway of Eternity"
Принцип оборотня with "Time and Again", "Ring Around The Sun", "Time is the Simplest Thing" and "The Werewolf Principle"
Город with the Fixup novel "City", as well as the original story volumes "Strangers in the Universe" (11 Stories) and "The Worlds of Clifford Simak" (12 Stories). In addition, a collection of "Grotto of the Dancing Deer" should be included, but it is not yet clear which stories are specific. At IzliT, also in Russia, this year the anthology Переводы I: Сборник произведений зарубежных авторов will appear. These are the stories of Clifford Simak in this book: "The Money Tree" and "The World That Could not Be"
Dinosaurs II with the Story "Small Deer"
Also at Baen Books the e-books appeared of the above mentioned anthologies from Hank Davis Future Wars ... and Other Punchlines (2015, with "Honorable Opponent"), Worst Contact (2015, with "Shadow World") and If This Goes Wrong ... (2017, with "Day of Truce"). The anthology "Strangers No More: Tales of Alien Life by Science Fiction Masters", announced in 2017 by Dover Publications as a print edition now appeared as an E-Book. So we now also know which story is contained: It is once again "The World, That Couldn't Be". Already in 2010, the anthology Beyond the Moons of Fomalhaut: A Collection of Science Fiction Stories - Vol 1 was published at ignacio hills Press. It contained the Simak story "The Street That Wasn't There". The Anthology Realtà Diverse was published in the Italian e-book series "Collana Universo" in 2015. This is supposed to have included a Simak story. This e-book was apparently withdrawn from the market, which is why I have not been able to determine which story was it. Last summer, something remarkable happened: on the internet platform esperanto.us appeared the first transfer of a Simak plant in Esperanto with Stacidomo. This is "Way Station". At Jimcin Recordings, a whole series of digital audio books was published in 2012 under the title "Favorite Sci-Fi Stories". In Favorite Sci-Fi Stories Volume 6 was also included "The Street That Was not There", which I had overlooked so far. The British hardcover edition of Highway of Eternity. Thanks Roberto! Finally, there is a reasonable picture of this issue! With Esperanto, there are now 34 languages into which the works of Clifford Simak have been translated so far! Just before the end of the year a minor update. Another Brazilian anthology A Revolta do Robôt of 1962 with the story "Final Gentleman" I have only discovered now. In the Italian edition of Fantasy & Science Fiction a translation of "So Bright the Vision" appeared in April 2016. The last time there was this story in Italian 46 years ago. Also at CreateSpace appeared in December once again Empire. With exactly the same title it was already published in August, but there it had another ISBN. Also the Anthology Tales of Time Travel - Book Five is published at CreateSpace. It contains "Project Mastodon" of Clifford Simak. At Adventure House, a reprint edition of Thrilling Wonder Stories, 12/38 appeared in October. It contains the Simak story The Loot of Time. This story appeared only in March in Volume 5 of the Complete Short Fiction of Clifford D. Simak; but this anthology is at the time only available as an e-book. Jovian Press released Hellhounds of the Cosmos and Empire. In 2012 there was the play in Cranston Return To Planet X Minus One; An episode in it was designed by Simak's story "Lulu". In 2014 the play Atomic Bride of X Minus One was performed in Providence. This time, edit the Simak story "Junkyard". The picture for the Brazilian anthology 10 Grandes Histórias de Ficção Científica has been added. For the Bulgarian anthology Девет живота could be found out the Simak story contained in it. It is Възпитателите (The Sitters). Many thanks to Ivaylo from Blagoevgrad. In recent months, there have been new releases and announcements. Therefore, another update. La leggenda degli anni senza fine was a performance of a school theatre in Fiesole near Florence in 2009, inspired by Simaks City cycle. Although I was aware of it, I had forgotten it in the last update. Roberto reminded me, thank you. Also appeared at Speculative! an MP3-CD Favorite Science Fiction Stories: Volume 5, which contains the story "Project Mastodon"
In Japan, a new edition of Way Station was released in 2015, which I only discovered now. I found an edition of Ciudad (City) in Spanish, whose cover picture I did not know yet. The book was published by Octaedro in 2003. I was able to locate a publisher with this name only in Barcelona (Spain), but the book has only appeared on Latin American sales pages and the ISBN refers to Mexico. I guess, therefore, a Mexican edition. 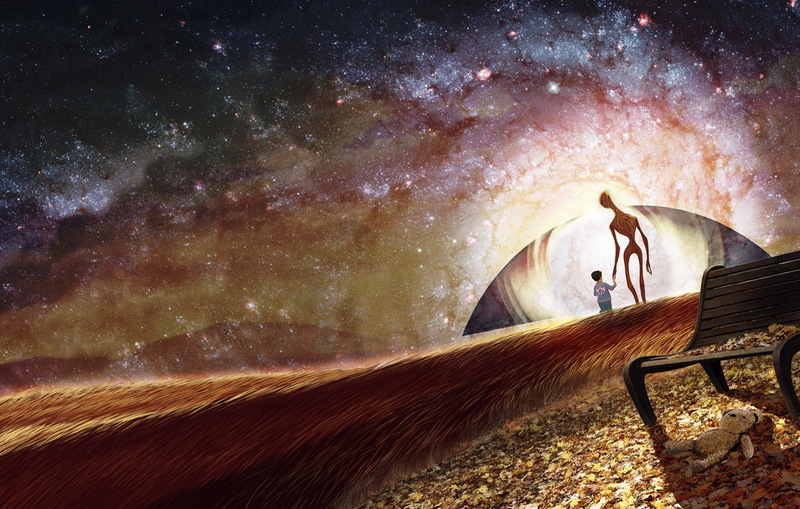 The publisher "Bottom of the Hill" released the anthology "The Best of Galaxy. Volume Two" in July. This contains a Simak story which I have not yet been able to identify. For February 2017 the anthology Strangers No More: Tales of Alien Life by Science Fiction Masters is announced by Dover Publications. I received the tip from Rias Nuninga (from the International Philip José Farmer Bibliography). Also here I do not know which Simak story will be included. In September at Armchair Fiction appeared the 12th volume of the series "Science Fiction Gems". It is the fifth time that this Series contains a Simak story. This time it is "The Fence". Already in August appeared an anthology at Bean Books: Things From Outer Space. This includes the story "Operation Stinky". The book is also available as an e-book . The World That Couldn't Be and Empire appeared at Ozymandia's Press. Chasma Press released Hellhounds of the Cosmos and also Empire. At Anncona Media in Stockholm, all the titles, which appeared as audio books (see above), came out as English-language e-books: Empire, Hellhounds of the Cosmos, Project Mastodon und The World That Couldn't Be. By this publisher also Second Childhood and The Street That Wasn't There appeared in English. To the theater performance of How to Make a Man 1960 in Detoit I found a newspaper notation and could thereby determine the theater (Cass Theater) and the period (Dec 29, 1960 - Jan 07, 1961) closer. It was possible to clarify which story is contained in the French magazine Lui, Fevrier 1964. It is "Condition of Employment" (French title "Le Nerf de la guerre"). I had actually made the fact that the title story "The Ghost of a Model T" did not appear in the contents list in the third volume of the series "The Complete Short Fiction of Clifford D. Simak" The error has been fixed. The volumes 2 and 3 of the series "The Complete Short Fiction of Clifford D. Simak" have now actually been published as print editions. The page numbers were added. 5 title pictures have been exchanged for better ones. The bibliography has been existing for 3 years. The time was right, again to try something new: I have now decided to include movies, TV and radio broadcasts, and even stage plays. This is not a radio play, the story was read only. From this TV film, there are several items available on VHS, DVD and stream. Unfortunately all British TV episodes (from "Out of this World" and "Out of the Unknown") are gone lost, because the tapes were erased. There is also a Hungarian movie: Séta, turned to the motives of the Simak story "To Walk a City Street"
On the Story How-2 a play was staged, which ran in 1960 in Detroit and 1961 on Broadway in New York. Already 2014 and 2015 appeared 2 reprint editions of "The Solar System: Our New Front Yard", which I had previously overlooked. Once in hardcover at Sagwan Press and secondly as a paperback at Nabu Press. The Goblin Reservation in the new series "The Best of Sci-Fi Classics"
City also in the series "The Best of Sci-Fi Classics"
Special Deliverance as already the 9th book in the series "Serebryanaya kollektsiya fantastiki"
and in the same series the collection Фото битвы при Марафоне, wherein it is an identical issue of the British collection The Marathon Photograph and other Stories from the year 1986. On Open Road Media in August the volumes 2 and 3 of "The Complete Short Fiction of Clifford D. Simak" will also appear in print editions. So then there are 3 of 14 volumes of the series in printed editions. It remains to be seen whether the other 11 books will also have their print version. On Vintage will appear on July 12 The Big Book of Science Fiction, a thick book with 1216 pages. From Clifford Simak is the short story "desertion" contained therein. In the fall of 2015 Hard Press Publishing had already released an e-book series; a few days ago, the titles now also been published as paperbacks: Empire, Project Mastodon, The Street That Wasn't There, The World That Couldn't Be und Hellhounds of the Cosmos. At Gateway in London now some of the e-books that are available since many years in the yellow unit cover, appeared in a new design with the series note "Gateway Essentials". For the bibliographer is problematic that these issues have the same ISBN, like their predecessors, and that was maintained at Amazon & Co as publication date, the original date. It looks therefore as if there are these books have been in 2011 or 2012 with the current title picture, actually this title images are not appear until 2016. Of the previously 18 novels which published by Open Road Media, there are thus 17 as audio books. Missing only "Werewolf Principle", which is, however, already appeared in 2014 on Wild Voices. Further CDs will appear from September 2016 - These I have not yet been included in the bibliography. For the Yugoslav magazine Zeleni dodatak 244 of 1969, which contains the story Honorable Opponent, the cover could be supplemented. After a break of more than 4 months finally a update. "Second Childhood" was posted on 01/25/2016 in the "Project Gutenberg". It was shortly thereafter several times published as e-books, but also appeared as print edition at Positronic and (as already mentioned) at CreateSpace. For a really rare published story was finally once again unearthed. The last English publication appeared in 1954 - 62 years ago! "Empire" also appeared tied with "The Country Beyond the Curve" by Walt Sheldon in the series "Armchair Fiction Double Novel"
In Italy appeared after a lapse of 11 years once again City, also available as e-book. Striking: Mondadori has the first Italian edition published in 1953 and printed the book since then in 6 issues always under the title "Anni senza fine". So now simply "City". in the Russian anthology Тени минувшего appeared the story "The Thing in the Stone". Eight Australian editions of "Astounding Science Fiction" from the 1940s and 1950s have been added. Of the 18 previously published novels by Open Road Media appeared already 16 as audiobooks. Lack only "Project Pope" and "Werewolf Principle". But the latter is published in 2014 by Wild Voices. X Minus One: Season Two, is said to contain again "Courtesy"
X Minus One: Season Three, contains "Lulu" and "Drop Dead"
the 10-CD box Science Fiction Classics with the story "Junkyard". the 3-CD box Great Radio Science Fiction: 8 Legendary Radio Programs. From Clifford Simak were two stories included: "Courtesy" and "Lulu". Of course, all radio plays are the same original productions from the 1950s. In the field of e-books will not return here detailing all the new releases. There are mainly reappeared the public domain titles, for example by publishers as Amazing Sci-Fi Classics, Positronic and HardPress. After "Second Childhood" was Public Domain, the publisher "Unforgotten Classics" has extended his collection with the previous 5 works (Empire & other tales) on all 6 public domain titles (Clifford Simak - The Golden Age of Science Fiction). In the UK, also City has finally published as e-book. In contrast to the print version of Gollancz the eBook also contains the "Epilog". Thus on the Island now all novels of Simak in electronic form. I had already received advance all three volumes in the bibliography, but now I could then enter the content. There about 10 pictures were replaced with better ones. Yesterday, the first three e-books of the series "The Complete Short Fiction of Clifford D. Simak" appeared (see below). Reason enough for me to make a further update. The thumbnails in the middle frame "Releases" will no longer be loaded directly after calling the page, but only if you scroll down. So loading the pages faster, because there are only loaded the images that actually provides the user. It can be seen on the gray placeholders, which are sometimes seen briefly. For better distinction, whether one is in search mode or in the normal investigation mode, the left and middle frame in the search mode now have a greenish background color. In the normal mode these frames remain as before yellow. In the "Leopold Classic Library" was released this year after "Empire" (see Listing from August 3) now also Project Mastodon. As I found out in the meantime, the publisher's head quarter is in Kiev in the Ukraine. Also "Hellhounds of the Cosmos" experienced this year further expenditure, including two on the self-publishing platform Amazon, CreateSpace: one in July, the next in September. Another release of "The World That Could not Be" there was in the anthology A Wisconsin Harvest Vol. II, which appeared in 2013, but was discovered by me until now. In the area of E-Books I'm here not always mention all publications in the history that have been added, especially if they are elderly. Altogether there will be 14 volumes! However, as it stands, the volumes 2-14 appear only as e-books. On July 21, 2015, the first 9 novels were published: "City" (1952), "Time is the Simplest Thing" (1961), "Way Station" (1963), "All Flesh is Grass" (1965), "The Werewolf Principle" (1967), "Out of Their Minds" (1970), "Enchanted Pilgrimage" (1975), "Shakespeare's Planet" (1976)) und "A Heritage of Stars" (1977). Now, for December 1, 2015, the next 9 novels announced: "Time and Again" (1950), "The Goblin Reservation" (1968), "A Choice of Gods" (1971), "Our Children's Children" (1973), "Mastodonia" (1978), "The Fellowship of the Talisman" (1978), "Project Pope" (1981), "Special Deliverance" (1982) und "Highway of Eternity" (1986). In total, therefore, 18 of the 27 novels of Simak are available as eBook at Open Road Media. It therefore lacks only "Cosmic Engineers" (1939), "Empire" (1951), "Ring Around the Sun" (1952), "They Walked Like Men" (1962), "Why Call Them Back From Heaven?" (1967) , "Destiny Doll" (1971), "Cemetery World" (1972), "The Visitors" (1979) and "Where the Evil Dwells" (1982). Again, these are again exactly 9 novels; maybe they appear next year. the Czech Fanzine Argus 5 of 1986 with the final narrative "Epilog" from the City cycle. There about 30 pictures were replaced with better ones. Today is the 111th birthday of Clifford Simak! On this occasion I decided to extend the functionality of my online bibliography. There is now the possibility of a full text search of the entire database. This is especially of advantage when e.g. knows the name of an anthology or the title of a translated book, but do not know what works (novels or short stories) by Clifford Simak contained therein. Previously, it was so that you always had to know the original title of the work to find something. I think that this search function is a major advance. Here, for example, the search for "Open Road" - and you will find all the new books and e-books from the publishing house "Open Road Media". The restriction, that you can not let all the works show at one time, was canceled. To date, if more than 200 publications to be displayed, a security question was asked whether you want to take the risk. For some settings (all languages, all countries) the opportunity was not even offered. Immediately you will find in the left frame "works" at the end of the list always the option to display all items. However, now only a maximum of 100 entries in the middle frame "Releases" are displayed. The other entries are listed on other results pages which can be reached via a small navigation menu as it example knows by search engines or web shops. Of course, the new internal search function also works with this navigation menus. The list box "filter" now also has a direct effect on the items displayed in the left frame "works". Do you choose in "filter" for example "Anthologies", left in the frame "works" only the works will be displayed that are actually published in anthologies. So far, this "pre-filtering" had considered only the settings for language and country. This innovation seemed reasonable to me, because now e-books and audiobooks are added (see below), which can also be selected through the "filter". Thus, for the frame "works" now equal to all the relevant stories and novels that are actually published as e-books or audiobooks. In the frame "Releases" or "Search Results" as well as in the frame "Details" you can now find symbols (pictograms), which already show at first glance whether it is a book, magazine, eBook or audiobook. The "information about the plot" has been around from the very beginning in the frame "Publications" (there always at the top behind the title of the work). This function has now been introduced in the frame "Details". There you will find behind each entry in the table of contents now the -icon. So you can, for example, quickly the content summaries of all stories of a collection read consecutively. However, the texts of these abstracts are still only available in English. The new features are not yet incorporated into the help. I'm working on it. Newly added to the bibliography are now E-Books and Audio Editions (audio books and radio plays). These media can be selected on the top right list box "filter". I try to limit myself to official and legal issues, but it is not always easy to identify them unequivocally. So far I have collected about 185 e-books. Audio editions there are so far about 80 editions (CDs, tapes, online editions). the first volume of the new series "The Complete Short Fiction of Clifford D. Simak": I Am Crying All Inside and Other Stories. The book will be released in October, but I've ever shot with. Very important to mention is: This book will include a previously unreleased story of Simak: "I Had No Head and My Eyes Were Floating Way Up in the Air" !!! This story was written by Simak in the early seventies for Harlan Ellison's anthology "The Last Dangerous Visions", which, however - has never been released - until now. More than 40 years after the emergence of the story and 27 years after the death of its author it is now but still appear - that we may experience this yet! the publisher Open Road Media, in which the new series appears, has also launched 9 novels as e-books and two of them as printed editions: City and Way Station. All of these issues appeared two weeks ago, on 21 July 2015th. two new editions of "Empire", published in 2015 by Leopold Classic Library and CreateSpace. Let's see how many issues are yet to appear. the English-language anthology Sense of Wonder, published 2011 by Wild Side Press, also as an e-book. It includes the story "Grotto of the Dancing Deer"
a new Bulgarian edition of All Flesh is Grass, published in January 2015, also as an e-book. . I find a very nice cover picture! two new Russian editions:: Enchanted Pigrimage, published in May 2015, and Time and Again, which only appears these days. As it stands, the publisher Eksmo from Moscow brings out in his series "Serebryanaya kollektsiya fantastiki" ("Silver collection of Fantasy") all novels so gradually again. This is already the 6th and 7th novel. two Russian print-on-demand editions from the year 2012: City and All Flesh is Grass. an older Russian edition of The Goblin Reservation, published in 1991 in Kishinov what was then a part of the Soviet Union and today it is the capital of Moldova. the new Polish magazine SFinks Rewolucje 01 (53) 2015, in which the story "Skirmish" is included. In 2001/02 was published in the Hungarian magazine "Füles" a 15-part comic book series based on motifs from "City". Although I have no original title pages of this magazines, but I have instead received respectively the first page (of the two-side-Comics). This is certainly much more interesting for us in this case. There about 70 pictures were replaced with better ones. This website exists now already more than 2 years. And yet I always find me hitherto unknown publications. That's why I'm doing again an update. This time, it is mainly Greek books. the Greek Anthology Διαβάτες από τ' Αστέρια, that contains the story "Μια Αναγκαία Προϋπόθεση Εργασίας". The English original, I have not yet been identified. the Greek Antholgie "Είναι Ανάμεσά μας" with the story "Skirmish" already existed in the bibliography. After the 2004 edition, it is later (ca. 2013) once again appeared with altered cover art. the anthology "Ιστορίες με Εξωγήινους" (Thematiki Antholoyia epistimonikis Fantasias, Tomos 5) with the story "The Big Front Yard" we had also been collected, so far without image. Now there is the issue from 1979 with an image and brand new an earlier edition of 1978 with a different cover art. for the anthology "Όλες οι Παγίδες της Γης" (Thematiki Antholoyia epistimonikis Fantasias, Tomos 2) with the story "All the Traps of Earth" there were apparently two different covers. In addition to the already existing output there is another issue with other Coverdesign (using the same image). Since I have no reliable data, both issues associated with the 1977 preliminary. at Cretive Space recently appeared a reprint of the magazine Comet Stories, July 1941. This includes (once again) the story "The Street That Was not There", which wrote Clifford Simak together with Carl Jacobi. Not yet released, but announced for autumn 2015, a German edition of "Science Fiction Hall of Fame Vol. 1" in two volumes. Part 1 will include "Huddling Place". It is the first German publication of a Simak story in an anthology in 26 years! the Czech magazine Interpress Magazín 1968 contains a translation of "Target Generation". Unfortunately I do not have a picture yet. the Czech literary magazine Světová literatura 1977/3 with a translation of "Good Night, Mr. James". the new French translation of "City" is now available in paperback: Demain les chiensappeared recently in April 2015.
as already mentioned above, the Greek Anthology Ιστορίες με Εξωγήινους from 1979 with "The Big Front Yard"
There about 120 pictures were replaced with better ones. I have also made technical corrections. For example, contained the first Japanese edition of The Worlds of Clifford Simak an incorrect table of contents. I assumed that all 12 original stories are included in it, but it are only the 6 stories of the first US paperback edition. This is now corrected. I recently again a little more intense research on the Internet, especially in goodreads.com, and I have found there publications by Clifford D. Simak, who were unknown to me so far! Especially this time there are Thai (!) issues, which complete our bibliography. the Thai translation of the US-Anthology Grand Masters' Choice of 2005, therein the Simak story "The Autumn Land"
the Lithuanian anthology Pragaištingas krėslas from 1992 with the translation of the story "To Walk a City's Street"
to Swedish anthologies: Det hände i morgon 7 of 1977 with the story "Senior Citizen" and Det hände i morgon 9 of 1978 with the story "The Autumn Land"
Approximately 20 more images have been replaced with better ones. With the Thai translations there are now 33 languages, in which were the works of Clifford Simak translated so far! another Polish anthology from the series "Galaktyka Gutenberga": Ten świat musi zginąć!, just released new on December 1st, 2014. Included is the Simak story "Hellhounds of the Cosmos"
the US magazine in Polish language Tematy 23-24 from autumn / winter 1967 with the story "The Answers". Interesting: Zbigniew Brzeziński belonged to the editors. the Polish Magazine Ameryka, Numer 177 from November / December 1973, in which the story "The Answers" was reprinted. Unfortunately I have not found a picture to it. two editions of the new Italian magazine "Fantasy & Science Fiction, Edizione Italiana": Anno I, Numero 1 from June 2013 contains "All the Traps of Earth" and Anno II, Numero 7 from February 2014 contains "The Autumn Land". the Italian Children's Encyclopedia Scoprimondo 12. Voli Spaziali from 1974 will contain the story "Target Generation". I have now discovered an edition of 1980 and I can only assume that it is a text-same edition. two US anthologies specially printed for the Canadian market: Crossroads in Time from 1953 with "Courtesy" and Men Hunting Things of 1988 with "Good Night, Mr. James". Approximately 60 more images have been replaced with better ones. More than 330 images have been replaced with better ones. Among them are 180 cover images from my own collection, which I have once again been scanned. The previous pictures did not always have the maximum size of 750 pixels. a new omnibus, that containing 3 novels and 5 stories: The Clifford Simak Collection from October 2014. Included are the works that are available in Project Gutenberg ("Empire", "Hellhounds of the Cosmos", "Project Mastodon", "The World That Couldn't Be "and "The Street That Wasn't There ") and the two novels "Cosmic Engineers" and "Ring Around the Sun" and the story "Galactic Chest"
another omnibus, that was released a few days ago (at November 24, 2014): The Clifford Donald Simak Science Fiction Collection contains again "Empire", "Hellhounds of the Cosmos", "Project Mastodon" and "The World That Couldn't Be". a new edition of the anthology series Armchair Fiction: Science Fiction Gems, Volume Eight from September 2014 with the story "The Spaceman's Van Gogh"
the French anthology Béni soit l'atome et autres nouvelles du futur from August 2014 with the story "Skirmish"
from the same publisher ("Hatier") an anthology in English language Science Fiction I from the year 1991 with the story "Desertion"
the French magazine Fiction Collection n° 7 of about 1956, with the story "Shadow Show"
the Georgian edition of the Russian anthology Expedition to Earth from the year 1969 with the story "The Big Front Yard"
two Georgian translations of Simak novels: The Goblin Reservation und Time is the Simplest Thing - both released in the year 2009..
the Polish anthology W pałacu władców Marsa, published in October 2014. It included the story "Project Mastodon" by Clifford Simak. the Romanian Almanac Almanahul Anticipația 1984, which contains the story "Limiting Factor". in the same series and the same year Science Fiction Special 22 with the novel "Cemetery World"
the Bulgarian magazine Космос, issue 3/1972 with the story "Condition of Employment"
the Russian anthology Человек и стихия '92 with the story "Drop Dead"
the Simak work The Trouble with Tycho of 1960, I had been listed as a novel so far. But it is about 60 magazine pages and 80-90 normal paperback pages for a novel actually too short. Therefore, I have now downgraded it from a novel to a story. This also corresponds to the classification in the ISFDB. I have also made a small technical change. In the field / frame "Details" below in the table of contents, so far the translated titles have been linked; now there are the original English titles. This can be seen, of course, only for non-English editions, e.g. in this Japanese edition. With the Georgian translations, we can say: The works of Clifford Simak have been translated into 32 languages! After a long time, I have now finally made an update. There about 250 more images were replaced with better ones. With 22 entries, the graphic artist of the cover images were supplemented or corrected. Thanks to Simon Jones for this information! the US Anthology Fantasy Super Pack #1 from 2014 with the stories "The Street That Wasn't There" and "The World That Couldn't Be"
a new volume of the series "Armchair Fiction Double Novel": The Wailing Asteroid / The World that Couldn't Be (also 2014). The novel "The Wailing Asteroid" was written by Murry Leinster, the story "The World That Couldn't Be" by Clifford D. Simak. the Soviet magazine Такая разная фантастика—2 from 1991 with a translation of "Honorable Opponent"
the Norwegian anthology Verdens beste science fiction from the year 1971 with the story "The Thing in the Stone"
the Slovenian anthology Kozmični Casanova in druge novele of 1963, which contains a story by Clifford Simak, whose original is not known to me. "Der Roboter Richard Daniel", based on the story "All the Traps of Earth" in the German edition of the Soviet magazine "Misha" [Part 1 (Issue 8/1990) und Part 2 (Issue 9/1990)]. the Ukrainian magazine in Russian language Кентавр № 6 from 1992 with the story "Drop Dead"
the Greek Antholgy Ιστορίες με Ρομπότ from 1977 with the story "All the Traps of Earth"
the Soviet journal Ровесник 12/1976 with the story "Honorable Opponent". the Estonian journal Horisont 7/1968 with a translation of "Desertion"
The guestbook was updated to the new version MGB 0.7. As a security check, the process reCaptcha is now used to better prevent the spam. I have exchanged about 80 more images. Has added a picture for the Swedish version of Galaxy Nr. 13 (Sept. 1959). Unfortunately, I do not know which original story is "Bekymmer". Brand new in the bibliography are the Spanish anthology Wonder Stories (1929-1936), published in June 2013 and contains the story "The Asteroid of Gold", as well as the Danish fanzine Nye Verdener, Nr. 3, Februar 1982 with the story "Skakmat" (presumably "Honorable opponent"). The information on the latter issue, I owe Rias Nuninga from the Philip José Farmer International Bibliography. Thank you! Another 70 images replaced with better ones. The following editions are new: A Russian magazine edition "Поражение" ("Beachhead") from 1990, the hardcover edition of "The Creator" from 1981, the facsimiles binder "The Complete Marvel Tales" also with "The Creator", a reproduction of the magazine "Galaxy" of June 1957 with "Lulu" and the Ukrainian anthology "Відкриття. Пошуки. Знахідки" with the story "Idiot's Crusade"
Appeared completely new are the Russian Edition "Грот танцующих оленей" ("The Grotto of the Dancing Deer"), which also contains the novel "The Goblin Reservation" next to the title story and a new translation of "City" in French. Also, the "SF Gateway Omnibus", was already included in the Bibliography. It will appear in November 2013 and included the novels "Time is the Simplest Thing," "Way Station" and "A Choice of Gods". Today is the 109th birthday of Clifford Simak. I have replaced about 160 images against better onces. New are the images of the Russian magazine "Fantastika" from the year 1990 with the story "The Money Tree" and the Hebrew edition of "Cemetery World" from 1980. Completely new feature is the "Anthology of Sci-Fi V21" from the year 2013, which once again contains the story "Hellhounds of the Cosmos". I have replaced about 80 more pictures with better ones. The two stories that are included in the Lithuanian edition of "Shakespeare's Planet" could be identified: there are "Goodnight Mr. James" and "Lulu". In the frame works now you can see even before clicking on a work, how many releases will be displayed. Note to the gray numbers in square brackets. These numbers are based on the settings for language and country. I have replaced another 170 images with better ones. Has added a new image to the Russian edition of "Cosmic Engineers" (Nonoparel 1991). An edition is a completely new addition: "Science Fiction Gems, Volume Five" (Armchair Fiction 2013). It contains the story "Galactic Chest"
Also, the guestbook has an English and a German user interface now. All pages were embellished graphically. On the pages Home and Imprint details of the graphic „Frères lointains“ by Phillippe Gaudy were used, on the page Help the cover image of the French magazine Bifrost N° 22, also by Philippe Gady. On the pages Sources and History you can see cover images of Simak books that appear at random. You can click on the thumbnails and maintain the bibliographic information for each edition. There were about 100 items exchanged for better eye images. 6 pictures are a completely new addition, including that of "Prehistoric Man". 4 new editions have been added, including the anthology "Science Fiction Super Pack #1" in two versions, which contains the story "The Big Front Yard". Three new books have been added: A new Czech edition of "City" and two Russian books: "Way Station" as single work and a new omnibus "The Goblin Reservation" with 4 novels including "Way Station". The warning at the option of "all novels", "all stories" etc. no longer appears as dialog box, but now as message directly in the middle frame. If the option "by title" is selected in the list field "order", not only the English articles are ignored, but also the articles in other languages (German, French, Italian, Spanish, Portuguese, Danish, Dutch, Swedish) such as The, A, Der, Die, Das, Ein, Den, De, Het, L', La, Le, Les, Az, I, Il, Gli, Un, À, O, Os, As, Las, Los, El, Al, Una, Det and Ett. Endre Zsoldos from Hungary told me the new link of his bibliography. I've replaced it on the "Sources" page. A previously unknown original story could be assigned by him. It is "Skirmish" in the Fanzine "Millennium Stories, No 1". In the frame "Releases" the authors (most Clifford Simak) and editors are now called. Some erroneous entries in the database have been corrected and some pictures were exchanged, eg "The Trouble with Tycho" (Ace Double D-517). I was born in 1958 and I am reading Science Fiction since I was ten years old. I lived in the GDR where publications of western SF authors were very rare. There were some books by Asimov, Bradbury, Sheckley and others. Until 1989 I knew only 4 stories by Clifford D. Simak which were published in different anthologies: “Lulu”, “Limiting Factor”, “All Traps of Earth” and “Drop Dead”. I found these stories extraordinary and the name Simak was graven in my subconscious. After the fall of the wall I was often in West Berlin and searched in different second hand book stores. The offering was amazing - and I focussed at the beginning on authors I was familiar with like Asimov, Clarke and of course Simak. Just by accident, I got my hands on some of his best works: “Way Station”, “City”, “All Flesh is Grass”, “The Worlds of Clifford Simak” and “All Traps on Earth”. I loved this books so much and I decided to collect all german translations. At this time there was no internet and all informations what books exist at all, I got from Bibliotheques. Around 1990/91 I built some small bibliographies with all novels and stories published in German or English. At the end of 1992 I owned already all books by Simak which exist in german translations. I have read them all (some of them even several times). But there was nothing to add. (between 1987 and 2010 not one single book by Simak was published in Germany). There was nothing more to collect. At the end of the 1990s, I had access to the internet. I think it was 1999 when I discovered at the first time the Clifford Simak Fan Page by Paul Bramscher. This site even included cover scans. I was astonished how many publications Bramscher found all over the world. I was also looking on other websites where I found more cover scans. I began to collect cover scans. I was at that time too lazy to build a proper data bank and I gave this pictures titles which already included the essential bibliographic informations. It can still be seen today when you look at the titles of my pictures. Between 2002 and 2009, I continued my hobby only sporadic. I was involved in a lot of other activities. At the end of 2009 I found time again and the world wide web has increased enormously. In a few months I collected hundreds of other Cover scans for my collections. I found as well a lot of sites with parts of bibliographies of Simak (for example isfdb.org and fantlab.ru) but I was not ready yet to decide to combine these informations to an own data bank. At the beginning of 2010 I studied in a course where I learnt HTML, Java Script, PHP and My SQL. My examen was a bibliography about Clifford D. Simak, which was already as structured like this website. But this bibliography was far away from being as extensive like today and it included only a small part of the publications (just english and german publications with a few bibliographic informations, no anthologies and no magazines). Just in in the middle of 2012 I could dedicate more time to my hobby “Simak”. I was planning to build a proper data bank where I combine all informations to all publications of Clifford Simak from all around the world. During my research I found always new sites and new pictures and my collection increased. This work took me several months and was completed in November 2012. Beside this research I designed the web site and I learned more about PHP/JavaScipt. Of course the official language of this site should be English. Unfortunately my knowledge of this language is very limited. The comments of the bibliographic part are translated by myself (often with the help of Google translator) but for longer texts (Home, Sources, Imprint etc. ), I needed help. I got in touch with Rüdiger Tomczak who overtook this part. Many thanks, Rüdiger! Around February 2013 the bibliography was finished in this form. We (Rüdiger and I) have checked here and there and adjusted it. 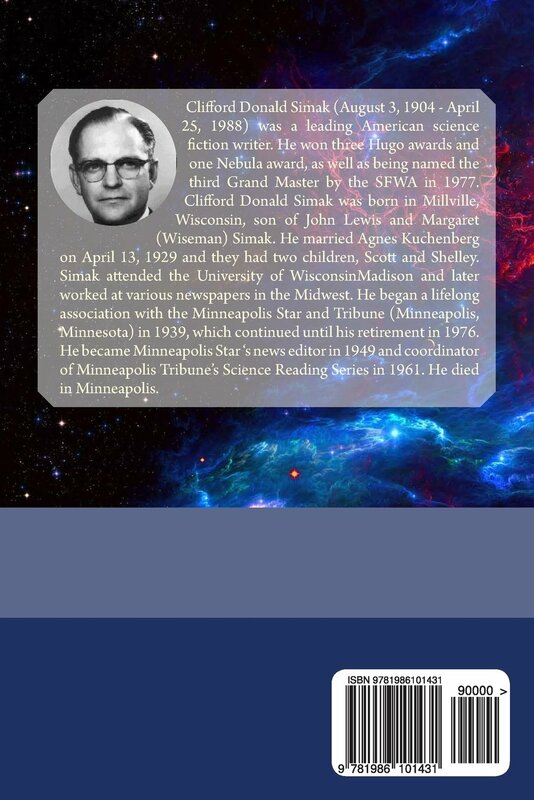 Now on April 25, 2013 the 25th Anniversary of Clifford D. Simak´s death we hand this bibliography over to the public.